Over the past decade or so, a number of people have made the following argument with regard to global warming: Yes, we know that not everyone agrees that global warming is going to be a problem. But the consequences if it is are so severe (potentially more than a billion people's homes inundated by sea level rise, more severe tropical storms, more deaths related to heat, etc.) that even those who aren't convinced it will be a problem should still act as if it were. The most recent one I can find from a significant environmentalist organization is this one from the NRDC. Of course the basic structure of this argument is not new: it is the same argument that philosopher Blaise Pascal used to justify being religious even in the face of uncertainty about whether God existed. In honor of him, this type of argument has come to be known as Pascal's Wager. As the introductory comments to this article told you, I myself thought, a number of years ago, that this form of argument might be worth pursuing, since the main thing we would need to do to try to mitigate global warming--stop burning fossil fuels--is something we (at least in the US) should be doing anyway, for a number of good reasons (less dependence on imports, improved foreign policy options in the Middle East and elsewhere, more domestic jobs in the energy sector, etc.). But that very observation of mine raises a crucial point: Pascal's argument only goes through if the cost of not doing something, and being wrong (i.e., global warming is a serious problem, but we don't do anything about it) is unequivocally greater than the cost of doing something, and being wrong. For Pascal, that was easy: if God exists, but you don't believe in Him, you get infinite punishment (Hell) whereas if God doesn't exist, but you do believe in Him, all you've lost are your Sunday mornings. (That's a little bit facetious, but if you read Pascal's own writings, you'll find it's not very much so.) With global warming, the situation is not so simple. The "solutions" that alarmists advocate for global warming would basically bankrupt the world economy, and even the milder solution I advocate (switching to nuclear power, and other non-fossil-fuel sources of energy) is not cheap (although it's certainly within our means if we choose to do it). We don't know enough about how the Earth's climate works to know for sure how it's going to change in the future. We don't know for sure what the limits of "natural" variability are, or whether the warming trend that was observed during the 20th century (about half a degree Celsius, or one degree Fahrenheit) was primarily due to that natural variability or was caused by human activity. Claims that "the science is settled" on this are simply not true, and we as citizens should be skeptical of such claims, even if they're made by supposedly authoritative organizations like the IPCC. That said, there are plenty of good reasons for us to stop burning fossil fuels as our primary source of energy. They create pollution (whether or not you think CO2 is a "pollutant", there are plenty of others); they make the United States dependent on countries that are, to put it charitably, less aligned with our democratic ideals than we would like--which means they also limit our foreign policy options in unpleasant ways; and before too much longer, we're going to run out of them anyway. So we should be shifting to alternative energy sources regardless of whether it will or will not have an impact on climate change. Most important: whatever may be in store for the world in the future, the best way to prepare for it is to make our economy as strong as possible. Even if it turns out that climate change does create serious problems, we'll be in a much better position to deal with them if we're rich than if we're poor. That means that the last thing we should be doing is imposing economic burdens on ourselves in order to "do something" about global warming. And, however distasteful it may seem, "ourselves" includes those evil corporations, even (gasp) "Big Oil". Who else is going to build those alternative energy plants? Bottom line: We'd all be better off if the alarmists stopped being so sanctimonious, and if everybody recognized that there are plenty of things we need to do regardless of how the climate change issue turns out, so let's just do them. IPCC: The Intergovernmental Panel on Climate Change. Their periodic reports are the main source cited by those who believe the world needs to do something about global warming. The Wikipedia article on global warming controversy summarizes the positions and has a good variety of links. US Climate Change Science Program: The US government's site on climate sciene. Real Climate: A site with articles by scientists who are actually working on modeling and measuring the Earth's climate. Good source of info about what work is going on in the field, and also good commentary on stories that get a lot of play in the media, from people who generally know a lot more about the real facts than the media do. I should note that the keepers of this site are in the "pro" global warming scientific camp, so they are not neutral in the debate (but who is? ); but the discussions usually focus on the science itself instead of the hype surrounding it (which is not to say that I agree with everything the site's owners say), and there are dissenting comments made and debated in the discussion threads. Global Warming: Competing Views: Ross McKitrick's global warming page. Open Mind: A blog by one "Tamino", whose real identity is apparently something of a mystery. It contains posts defending various aspects of the "consensus" in climate science on global warming, often in response to critiques posted at Climate Audit and other contrarian sites. Climate Science Watch: A nonprofit organization on the "pro" global warming side, that is, in their own words, "dedicated to holding public officials accountable for the integrity and effectiveness with which they use climate science and related research in government policymaking, toward the goal of enabling society to respond effectively to the challenges posed by global warming and climate change". ICECAP: A site devoted to publicizing evidence and arguments against the "consensus" view that human CO2 emissions are the main cause of global warming. Niche Modeling: A blog by a statistician that looks at various climate change claims and runs them through numerical analysis to see if they hold up. There is much useful discussion in the comments as well, from both sides of the issue. Climate Change: The website of Stephen Schneider at Stanford, an expert in the field and not particularly a zealot for either side, so the treatment of topics is fairly well balanced. Also good discussion of the ethical and political issues involved. Climate Debate Daily: This site is useful because it's nothing but links to articles, categorized by whether they are "Calls to Action" or "Dissenting Voices". The fact that the Earth has an atmosphere means that, when the surface emits longwave radiation, some of it does not escape into space but is absorbed by the atmosphere. The atmosphere then re-radiates the energy it absorbs; some gets re-radiated back to the surface, while some gets radiated out into space. This process of absorption and re-radiation is sometimes called the "greenhouse effect", because it is said to make the Earth's surface warmer than it would otherwise be. However, things are not quite so simple. If these radiative processes were the only energy transfers going on, the average "radiative equilibrium" temperature of the Earth's surface would have to be high enough for the radiated intensity to match the incoming shortwave from the Sun plus the longwave radiation re-emitted from the atmosphere back to the ground. It turns out that this average temperature would be about 60 degrees Celsius (140 degrees Fahrenheit)--in other words, this average would be hotter than the hottest peak surface temperature ever recorded on Earth (134 F at Furnace Creek ranch in Death Valley). Why is that important? Because, as we'll see, while the first of these two factors (the greenhouse effect) is fairly well understood, the second is not. By that I mean that, although we understand the basic processes involved in the hydrologic cycle (I've just described them), we do not have the ability to make detailed computer models of how the cycle responds to small changes in other parts of the system. In particular, we do not know how to model in detail what the cycle's response will be to a small increase in the amount of longwave radiation from the surface that is absorbed by the atmosphere (such as would result from, for example, an increase in CO2 concentration). That means climate models have to make assumptions about how water vapor, clouds, and precipitation will change. This is not insignificant, because water vapor is itself a greenhouse gas; in fact, about 90 percent of the "natural" greenhouse effect (i.e., the absorption of longwave radiation from the ground) is due to water vapor. Also, clouds reflect radiation in both directions: they reflect incoming shortwave radiation back into space, and they reflect outgoing longwave radiation back toward the ground. With all this going on, even a small error in the assumptions about the hydrologic cycle can cause significant errors in the model predictions. The above, of course, is just a first approximation; there are many other factors that can have significant effects. There are other greenhouse gases besides water vapor and CO2 (methane is probably the next most important); small particles emitted into the atmosphere (dust, soot, volcanic eruptions) can reflect incoming sunlight back into space and exert a cooling effect; and so on. But the basic balance between the greenhouse effect and the hydrologic cycle, and how they distribute the incoming energy from the Sun and finally re-radiate it back into space, is the central idea to keep in mind in what follows. Now let's briefly review the state of play in 2001, when the 3rd IPCC report came out. Probably the most widely quoted claim in the that report was that, based largely (but not solely) on the famous "hockey stick" graph created by climate scientist Michael Mann, global average temperatures at the end of the 20th century were the highest they had been in more than a thousand years. While by no means the only significant claim made in the IPCC report, it serves as a good example of why that report had the impact it did: it was a much stronger claim than had been made in either of the two previous reports, and it convinced a lot of people that yes, global warming was an urgent issue. Unfortunately, the "hockey stick" claim also serves as a good example of how the IPCC, and "pro" global warming climate science in general, often makes claims that later turn out not to be valid. Within two years, as this Scientific American article discusses, a critique of the "hockey stick" by Sallie Baliunas and Willie Soon had created much controversy. At that time (2003), the "hockey stick" appeared to have survived the criticism, but later analyses have confirmed the skeptics. A 2006 op-ed piece in The Washington Times, when warming's hockey stick breaks, discussed the results of the 2006 National Academy of Sciences Report, which concluded that the most we could say based on the evidence was that late 20th century temperatures were higher than they had been in the last 400 years--which, as the piece notes, is not surprising given that 400 years ago we were in the early stages of the "Little Ice Age", a cold period several centuries long that followed the "Medieval Warm Period", during which the vikings settled Greenland and created farms there on land which is now permafrost. The op-ed also noted that much of this controversy does not get any coverage in the mainstream press, leaving the impression that the science is more solid than it actually is. And of course the "hockey stick" graph, whatever its problems may be, says nothing about how warm it was six to eight thousand years ago, during what is called the Holocene Thermal Maximum. There are considerable uncertainties in trying to estimate temperatures that far back, but there is plenty of evidence indicating that the Earth was warmer then than now. In the light of this observation, the even more extravagant claims that have been made, that the Earth is warmer now than it has been, not just in the past few thousand years, but in the past few hundred thousand years, is evidently well in excess of what the data justifies. This is another theme that will come up repeatedly as we continue to walk through our state of knowledge about the climate. What is missing from much of this discussion is a sense of perspective. When you realize how much the Earth's temperature has varied over longer time scales, like thousands or even millions of years, it becomes evident that our human concerns, however important they may be to us, are small by comparison--we are worried over a degree or two Celsius when variations ten times that, or more, have happened in the past and will happen in the future. It is even possible, though not likely, that in the next century sea level rise and the other drastic consequences I outlined above will happen even if we stop emitting CO2 and its concentration drops--or, conversely, it may be that temperatures will cool into another Little Ice Age even if we keep on emitting CO2 without restraint (if it turns out that we are indeed at a maximum of solar output and it declines again--I discuss this further below). All of which just emphasizes that, whatever action we take about energy sources, we should also be avidly trying to increase our understanding and predictive ability with respect to Earth's climate--and we should be trying to come up with technologies that will help increase our options, whatever we might discover about the climate. Next, let's briefly look at the 2004 techno-thriller by Michael Crichton, which was reviewed by Reason Magazine not long after it came out. The review prompted me to buy the book and read it, and I found it, as the review had said, both informative and entertaining. Particularly informative was the long list of references in the bibiography at the end and the footnotes throughout the book (which the author was careful to point out were all real references, even though the book itself is fiction). I couldn't possibly do justice here to all the topics raised in the book; here I just want to explore one question that the book raises which is relevant to this article: Is it possible that global warming might be a good thing? For one thing, it might prevent another Ice Age--which, by the way, was the dire prediction of some environmentalists only a few decades ago: that the problem was not too much warming but too much cooling. (There has been a lot of complaining about this statement of Crichton's, which appears not only in State of Fear but in some of his published speeches--see this note below.) Clearly, some of the consequences of global warming (e.g., rising sea levels) will pose serious problems that will need to be dealt with, but if the benefit to be gained is preventing glaciers from covering most of the developed world, might it not be better to go ahead and let it happen, and direct our efforts towards dealing with the problems--e.g., either protecting or relocating populations at risk from rising sea levels--instead of preventing the warming? Real Climate's Review: This site does not have a high opinion of the book or of Crichton's climate science commentaries in general. Why Global Warming Would Be Good For You: An article arguing that global warming would actually be a good thing. Caltech Speech by Michael Crichton: Fits Crichton's critique of the current politicization of the global warming debate into a wider context of the relation between science and society. Crichton has also been on about this general topic in other speeches which are posted on his web site. Anti-environmental myths: A somewhat polemical site from the other direction, compared to Crichton--at least, he comes in for quite a bit of criticism, although some of this site's conclusions actually agree with his. In particular, this site and the Real Climate site above challenge a number of specific assertions about the past track record of environmentalism that Crichton makes in State of Fear and in some of the speeches linked to above. For example, see this page on the DDT ban, which Crichton likes to refer to as an example of over-active environmentalism taking far more lives than it saves. Another Crichton contention that is often disputed is his alleged claim that "scientists warned of an impending Ice Age in the 1970's", but actually Crichton didn't really claim that; what he claimed was that non-scientists took a tentative piece of scientific research, which was hedged about with lots of caveats and qualifiers and statements that further research was needed before drawing any conclusions, and made it into a doomsday prophecy--just as many non-scientists are now doing with global warming. As I understand Crichton's position, he isn't saying that scientists themselves are to blame for the doomsday prophecies, though he does sometimes take them to task for not being aggressive enough at drawing attention to the caveats and uncertainties in the research they are publishing. Current Measurements: These are direct measurements of key quantities taken by modern instruments. Ground-Level Air Temperature Measurements: Taken by weather stations at ground locations all over the world. Ocean Temperature Measurements: Taken by a network of buoys that is periodically expanded to cover more points, and by devices dropped by ships that record temperatures as they sink and relay them back. Aloft Measurements: Taken by airplanes and weather balloons. These measure temperature directly, but they also measure other variables, such as radiation emitted, which are correlated with temperatures. Satellite Measurements: Taken by orbiting satellites, these actually record radiation emitted by the ground and the atmosphere; this data is converted to estimates of temperature using basic physics and the known properties of materials. Other Direct Measurements: By various sampling methods, we can measure many other variables of interest, such as: gas concentrations in the atmosphere (CO2 gets the most attention, but there are plenty of others), humidity (water vapor is a greenhouse gas, so this is important), and others. Past Proxy Measurements: These are indirect measurements of past quantities (usually temperature) based on "proxies", which are things that are known to co-vary (with some margin for error, usually not insignificant) with temperature. Since all of these methods are indirect, they must be "calibrated" against direct methods to be useful. Also, the age of proxy samples must be established by independent means (e.g., radioactive dating) in order for them to be useful. 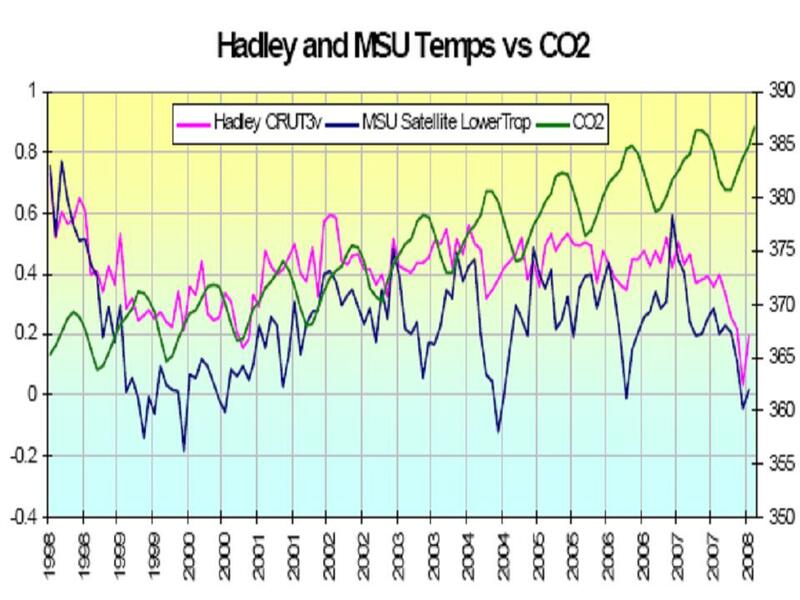 Finally, results from many different proxies must somehow be combined into a single estimate of temperature for a given past time and place; as the discussion of the "hockey stick" above showed, this is not a trivial procedure and must be done carefully. Ice Cores: These are taken from various depths at locations which are known to have had constant ice cover for a long period if time (Antarctica and Greenland are, of course, the two major ones). The mix of isotopes in gas bubbles trapped in the ice at various depths is used to estimate the air temperature at the time the gas was trapped. Also, of course, the actual mix of gases observed tells us something about the atmospheric composition (e.g., the concentration of CO2) in the past. However, this only works if the composition of the gas in the bubbles doesn't change over time, which is a questionable assumption. Tree Rings: These are usually thicker in warm years and thinner in cool years (since the thickness is linked to growth rates, which are linked to temperatures). Different trees have different growth rates, so the aim is to collect ring samples from as many kinds of trees as possible and look for patterns and correlations between them. However, there are also a number of other factors that affect tree rings, so it takes heavy-duty statistics to try and tease out the correlation to temperature; this procedure is fraught with pitfalls (quite apart from the pitfalls of combining multiple proxy measurements into a single estimate of temperature). The above all seems straightforward enough (aside from the obvious uncertainties in using indirect estimates of temperature, as noted above), so it is rather disappointing to observe that the different parties in the debate over global warming often don't agree on what the data is! As I noted above in the discussion of Michael Mann and the "hockey stick", this is only possible because many researchers in the field don't make their data publicly available. The result is that, when you read articles, discussions, and even supposedly authoritative documents like the IPCC reports, you can't always be sure how reliable the data is that they're quoting. This is not good. Also, skeptics have questioned whether the air temperature at the Earth's surface is really the right datum to use when quoting the "global average temperature". It's easy to calculate that, in terms of total heat content, Earth's oceans are the real issue: they contain thousands of times as much heat as the atmosphere does. However, data from buoys that have been recording ocean temperatures since 2003 show no warming. Nobody really knows why, but you'll notice in the article just linked to that Kevin Trenberth, one of the IPCC report's key authors and advocates, is quoted as saying that "we don't have adequate tracking of clouds to determine exactly what role they've been playing during this period"--in other words, there are potential negative feedbacks that aren't well understood. Furthermore, as we noted above, even the air temperature trend was basically flat from 1998-2008; in fact, looking at this graph, you can see that there has actually been a slight down trend in lower troposphere air temperatures since 2003 (even leaving out the sharp cooling over the past year). First, the uncertainties in the models (when you take into account the uncertainties in the data itself and the uncertainties in how the models extrapolate from the data) are of the same order of magnitude as (if not larger than) the effects being predicted. The climate change we're worried about for the 21st century is a few degrees Celsius, and the uncertainties in the predictions are also a few degrees Celsius. You can't reliably conclude anything when the noise is as big as the signal you are trying to detect. Second, we don't fully understand all the causal factors at work in climate change; we tend to focus on CO2 not because it's known to be the most significant factor, but because it's one of the few that we do understand fairly well. But that's dangerous as a guide to policy: even the IPCC reports admit that we have a "low" level of scientific understanding of other important causal factors (two in particular, solar and water vapor, will get more discussion below). Urbanization Effects on Temperature Measurements: An article about the "urban heat island" effect (which is kind of a misnomer--one of the key observations in this article is that surface temperature measurements even in supposedly "rural" areas can still be significantly higher than they would have been without any human activity in the area). No discussion of the issue of global warming would be complete without some discussion of Al Gore's polemical movie. Not long after it came out, I happened to wander through Border's and see a copy of the book version. I hadn't seen the movie (and still have no intention of seeing it), but I decided to at least give the book a brief look to see what I thought of it. Well, anyone who knows me knows that when I give a book "a brief look" in a bookstore, you're talking at least an hour. I didn't purchase the book (for the same reason I don't intend to pay money to see the movie), but I did get enough of a sense of it to be able to give some impressions here. When I read a howler like that just in the first few pages of a book, I usually close it and put it back on the shelf at the bookstore. But I gave this one the benefit of the doubt and went on. I didn't find any more howlers of the magnitude of the one I've just described, which of course is not in itself a very meaningful datum (other critics have found plenty, as you'll see from some of the links below). But I still got the sense that, although Gore obviously had a lot of good scientists giving him input, much of it wasn't fully clear in his head. Perhaps it comes across better in the movie, but the impression I got from the book is that Gore doesn't really grasp the complexity of the science; he just gets a few main bullet points and runs with them. But the complexities are crucial, because they undermine any simple assertion that we know what is going to happen to the climate in the future. And Gore either doesn't understand that, or has decided that it doesn't matter. Why is that bad? Because when you exhort people to take drastic action based on claims of knowledge, it had better be certain knowledge. For those who aren't familiar with the scientific standards for certain knowledge, here's an example. When the Voyager spacecraft reached Jupiter, about ten years after launch, there was a period of radio silence while the spacecraft went behind the planet and its transmissions were blocked. Scientists predicted the time that that event would be observed on Earth to within about a second--one second in ten years. That's an accuracy of one part in 300 million. The scientists didn't present alternative "scenarios" of when the event might occur; the prediction they gave wasn't a "best fit curve" or a "balance of probability estimate"; it was a definite prediction, and it was right. That's the standard. It's true that we can't always get an accuracy of one part in 300 million; but when we have real knowledge, we can make real predictions, not just spin alternative scenarios that might bear some resemblance to what actually happens. That is not to denigrate the efforts of the many, many scientists who have worked and are working in the field; it's just an observation that the problem is hard. And when problems are that hard, you don't claim to have certain knowledge. Most of the scientists in the field know this, and they are careful to say that their predictions are based on models, that they are not exact, that there is room for error, that they are possible scenarios of what might happen. But Gore doesn't say that, not in the book, not on the web site, and from what I can read in reviews, not in the movie. He says we know what's going to happen in the next century, the same as we know that the sun is going to rise tomorrow. And we just don't know to that accuracy. Yet Gore makes this a moral issue: he says that, if you don't do something about global warming, you're immoral, just as if you'd stood by and let someone drown or starve to death. I can think of other figures in history who have given similar moralistic exhortations based on less than adequate knowledge, but I won't name them here, since the point of this article is to take polemics out of the debate. So in the end, I have to wonder whether the good recommendations Gore does make will get lost amid the political spin. If the movie had taken a more pragmatic, less moralizing tone, I think it would be much easier for people to get on board; but by making it a moral issue, it seems to me that Gore is more likely to polarize the debate than to get people to think. Here are some links specifically related to the movie. Climate Crisis: The web site behind the movie. Don't bother with the "science" page--it says nothing you don't already know. Some of the "take action" links may be useful. The Wikipedia page on the movie also briefly discusses the book (and a 2007 update to the movie). The Moment of Truth: Al Gore's essay in the May 2006 issue of Vanity Fair. While Washington Slept: Another article in the same Vanity Fair about the political issues involved. Roger Ebert's Review: I've picked this one as being pretty much representative of what most mainstream media people are saying about the movie. Review from the New Hampshire Independent Media Center: A somewhat different take from a smaller media source. It's notable that this review does a much better job of pointing out significant questions left unanswered by the movie--not scientific ones so much as historical and political ones. (For example, why are only Republican administrations criticized, when Gore was Vice President for eight years and nothing much happened on his watch either? And if you think it was still too early then to know for sure that action was needed, why does Gore criticize the Reagan administration about the same issue?) It also picked up on the fact, which I alluded to above, that after all the polemics about how we need to do something now, the actual things we're told to do are pretty tame. Review on Weather Underground: Another more balanced review; it hits some of the same points as the previous one, but does a better job on the science in the movie. (For example, this reviewer picked up on the erroneous claim I talk about above, that CO2 emissions are making the Earth's atmosphere "thicker".) This review also isn't afraid to point out that the movie looks a lot like a Gore campaign ad, despite protestations to the contrary from you know who. Sundance Review: This reviewer (and several others that I have seen on the web) seems to share my concern that Gore is, as the reviewer says, "preaching to the choir"--the people who will listen to the movie's message are the ones that already believe it anyway. Reason Online Review: Another good look at the science presented in the movie (and the book, though the review is focused on the movie). One key point brought out in this review is time scales: many of the projected effects of global warming (the main one the review talks about is sea level rise) are predicted to happen on a time scale of centuries, but Gore's movie (and many other polemics exhorting us to do something about global warming) give the impression that they'll be happening much sooner (for example, the dramatizations of Manhattan, south Florida, Bangladesh, and other places being flooded certainly seem to suggest that the water is coming in fast, not over a time scale of centuries). This doesn't help much in preparing a rational response. Roy Spencer has some Questions for Al Gore after seeing the movie. You defy every tenet of democracy when you invite ExxonMobil to deny itself the right to provide information to "senior elected and appointed government officials" who disagree with your opinion. The letter hits on most of the major criticisms that have been made of the "consensus" on global warming (as well as making pointed comments on what free speech is supposed to mean--rather a role reversal from a couple of hundred years ago). Monckton has also fired several broadsides at Al Gore. In 35 Inconvenient Truths, he points out many errors in Gore's movie. (He is much harsher on the movie than I am in my review of it above, but we're not really in substantial disagreement: he's just focused specifically on showing how the scientific case isn't the slam dunk that Gore seems to think it is, which is a valuable contribution to the discussion. Also, of course, he's reviewing the movie whereas I reviewed the book, and a movie is going to have more polemical impact, which makes it more important to call out errors and misstatements it makes.) In 2007, Monckton funded a high court case challenging the use of An Inconvenient Truth in British schools. He is also funding a movie, The Great Global Warming Swindle, to make the opposing case and hopefully blunt the impact of Gore's film. Finally, in Gore's 10 Errors Old and New, he includes an interesting graph of global average temperature vs. CO2 levels for the past 600 million years: there is no correlation between the two. The article (which appeared in the magazine India Today) does not cite a source for this graph, so I don't know how the temperature and CO2 levels were estimated; however, it is useful to note that, as the Viscount says, CO2 is "plant food", and having more of it would seem to be a good thing as far as agriculture is concerned. Monckton has also taken pains to make sure the British public is aware of his positions. In a Daily Telegraph article in November 2006, entitled Climate Chaos: Don't Believe It, he shows the holes in the "consensus" and discusses other possible motives that the alarmists might have. (Actually, the link is to the first of two articles by Monckton, both of which are worth reading.) It is noteworthy that, unlike most pundits, Monckton provided a PDF (linked to in the article) containing all his references and detailed calculations. Soon after the IPCC AR4 came out, Monckton published a critique. I'll defer discussing that until we get to the AR4 below. In August 2008, Monckton participated in a radio debate on global warming. As uncomfortable as it might be, we must measure the cost of environmental degradation vs. the benefits of new prosperity. Are we willing accept half a degree of global warming to lift 100,000,000 million people out of poverty? What is the right trade-off? As I have already noted, the key things we would have to do to stop emitting CO2 are things that we are going to have to do anyway. And if we're going to have to do them anyway, surely the right time to do them is just when large developing countries like China and India are looking to make large investments in their infrastructure, rather than in the future when that infrastructure is already built and would have to be junked to get it out of the way. After all, as the blog entry makes clear, those investments are going to be made whether we like it or not, so the choice is not really between accepting global warming and accepting poverty for billions. To think that the only way for China and India and other developing countries to lift their people out of poverty is to burn coal and oil is to miss a golden opportunity. Now we have a framework in which to examine the current state of knowledge about the climate, and the most widely quoted summary of that knowledge is the IPCC's Fourth Assessment Report. Their page contains links to both the full report and the summary for policymakers (SPM). Also of interest is the Working Group Report on the physical science basis for the assessment report's conclusions. Also, there is a briefer article on the NOAA website, Global Warming Frequently Asked Questions, that summarizes the key items. The Summary for Policymakers (SPM) says that "there is very high confidence that the net effect of human activities since 1750 has been one of warming" (emphasis in original). Obviously this is driven by the above WGR estimate of solar irradiance, but note how weak the statement is: the net effect is one of warming, but there is no claim that human activities have been the primary cause of warming since 1750. The SPM also says that "most of the observed increase in global average temperatures since the mid-20th century is very likely due to the observed increase in anthropogenic GHG concentrations." Of course this also depends on the low estimate of the change in solar irradiance, though not as much since it's only covering the last half-century (but as we'll see, there is data suggesting that even over that shorter time period solar irradiance has increased). The upper bound given in the AR4 for the estimated sea level rise during the 21st century is significantly lower than that in the TAR; however, the latest report does say that its upper bound might be an underestimate because the effects of ice melting can't be estimated very well. However, just the fact that the upper bound of the estimate given in the report went down from the TAR was enough to start global warming advocates protesting. The AR4 says that the current global average temperature is likely (emphasis in original) to be higher than at any time over the past 1300 years; this is actually a stronger claim than that made in the TAR, which only extended the conclusion back over the past 1000 years. Of course this means that the IPCC still thinks it's warmer now than it was during the Medieval Warm Period; there have been a number of contrarians who dispute the methods used to estimate past temperatures based on indirect data. Also there are historical data that don't seem consistent with the IPCC's claim: for example, the Vikings were farming in Greenland until the 1300's, on land that is frozen today. This is not conclusive, of course, but it is food for thought. The Wikipedia article gives a good summary of the latest IPCC report's content. Wikipedia also has articles on Criticism of the IPCC AR4 and the Politics of Global Warming that are worth skimming. Also, in his Independent Summary For Policymakers, Ross McKitrick has posted a detailed summary and analysis of the AR4, done by a team of scientists (their credits are listed on the page). Worth reading and easier to get through than the AR4 itself (which does not seem to be written to be very readable). Global Cooling? 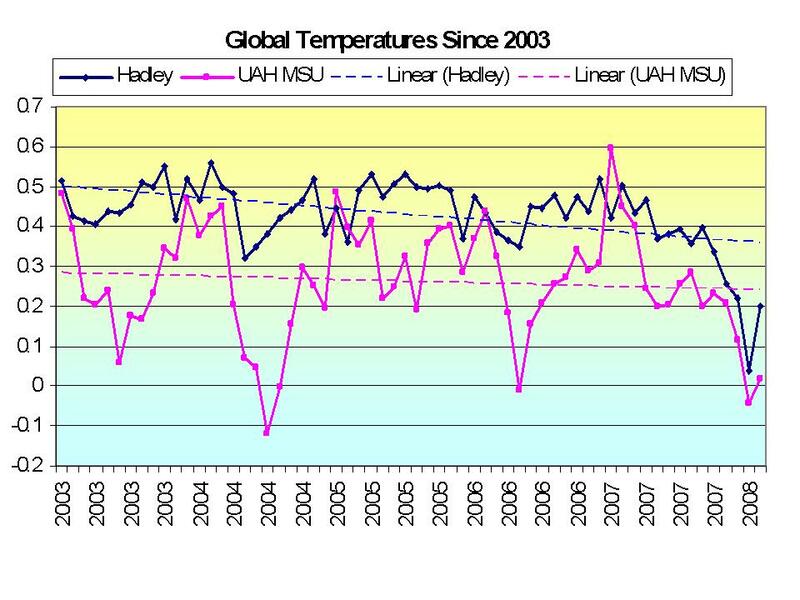 The period January 2007 - January 2008 showed a sharp global cooling, as shown in the graphs in this blog post by Anthony Watts. Of course this is a short-term change which may or may not be a sign of a longer-term shift in climate; but the fact that it happened brought to the fore some questions about exactly how the "long-term temperature trend" is calculated. When the IPCC quotes numbers like "0.17 degrees C per decade", which is their estimate of the trend over the last few decades, what they mean is that if you take the temperature data (averaged year by year) and do a linear regression on it, that's the slope of the trend line. This graph shows two examples of the technique. The other thing that the January 2008 news of sharp cooling over the past year did was to re-raise the possibility of significant global cooling, such as might trigger the next Ice Age. Of course this was what alarmists were on about in the 1970's, and they turned out to be wrong, but we know quite a bit more now than we did then about just how quickly previous glaciations began, due to all the work done with ice cores and other paleoclimatological data over the past couple of decades. For example, one study showed that, at the start of the last glaciation, Scotland went from about its current temperature to being covered with ice in about a hundred years. This all underscores the fact that we don't know with sufficient accuracy what will happen to the Earth's climate during the next century. But also, putting serious global cooling--meaning serious enough to start the next Ice Age--into the mix affects the Pascal's Wager argument, because the things we would have to do to prevent global cooling are different from the things we would have to do to prevent warming. Building nuclear power plants won't in itself help stave off the next Ice Age (though it may help indirectly if it makes energy available that would otherwise not be). And even a smaller amount of cooling--say, enough to put things back to where they were during the Little Ice Age, in the 1600's to 1700's--would have significant negative impacts, by shortening growing seasons and requiring more energy for heating (though less for air conditioning). For all the talk about heat waves, statistically cold causes more deaths than heat does. Solar Variability. As I noted above, the reason that GHGs appear to be the primary cause of warming in the IPCC AR4 analysis is that the estimate for solar variability is so low. To put in perspective just how small the AR4 estimate is, consider that the current total solar irradiance is about 1366 Watts per square meter; the AR4 estimate of +0.12 Watts per square meter increase since 1750 is therefore one hundredth of one percent of the current total irradiance. We do have to correct for the fact that the AR4 estimate is for the change in radiative forcing, which is not the same as the change in irradiance itself--it factors in things like absorption in the atmosphere and reflection of some of the Sun's radiation back into space--but even factoring those things in, the AR4 estimate translates to an estimated change in total solar irradiance since 1750 of 0.5 Watts per square meter or so, which is less than one twentieth of one percent of the current value. This is a very small change, but it's misleading because 1750 was in the middle of a brief period of increase in solar irradiance between two extended minima--the Little Ice Age before it, and what is called the Maunder Minimum after it, in around 1800. There was another minimum around 1900, and so if 1900 were chosen as the "base" year instead of 1750, the estimate of the change in total irradiance would be significantly larger--as much as ten times larger by some estimates, or up to 5 Watts per square meter--one-half of one percent. For example, see this report. It's odd that the IPCC would use 1750 as the "base year" for the estimate of net forcings (it is used as the base year for all the estimated forcings, not just solar), but would instead use 1900 as the "base" year for quoting temperature changes; and since the change in base year also has a significant effect on the relative magnitude of solar vs. greenhouse gas forcings, the choice of base year significantly affects the conclusions. Of course all of the estimates of past solar irradiance are indirect, but the point is that just seeing how widely they vary gives new meaning to the IPCC's admission that estimates of the effect of solar irradiance on the climate are made with a low level of scientific understanding. But if there really is, and has been, a significant solar effect on climate, how can it be that the climate models that were used to back up the IPCC report, which were all run on the assumption of a negligible solar forcing, were able to match the observed 20th-century data? Don't those models just calculate how much radiation is absorbed by CO2 and calculate a predicted rise in temperature using basic physics? Well, no, not just that. The models do use basic physics to predict how much radiation will be absorbed by CO2 and other GHGs in the lower atmosphere, but they do not convert that number directly to a temperature rise--because if they did, the predicted temperature rise would be too small. The reason the models are able to match the observed data is that they incorporate positive feedback effects--in other words, they assume that a given amount of temperature rise that is directly caused by CO2 absorption will have secondary effects that lead to some additional amount of temperature rise, magnifying the effect of the CO2 enough to account for the observed data. Feedbacks. How are these feedback effects calculated? That's another key issue: they aren't so much calculated as assumed, because, if you look at the details of the IPCC report, for example, you find that, while the basic science behind direct CO2 absorption of radiation has a high level of understanding (which it does), the basic science behind the feedback effects--things like the effects on cloud formation and water vapor retention vs. precipitation--have only a low level of understanding behind them. In other words, they can't be modeled the way the direct CO2 absorption is modeled. Instead, the feedback effects are calculated based on assumptions about the relative impact of the various factors. So in fact, the models are not as reliable as they seem to be if you just look at the CO2 piece of it; it's quite possible that the feedback effects are being modeled to be larger than they really are. In this connection, it is worth nothing that the most important feedback, water vapor, is also the most contentious, because it has obvious potential feedback effects in both directions. Warmer air can hold more water vapor, and water vapor is itself a greenhouse gas (a much stronger one than CO2), so this is a potential positive feedback (i.e., it will tend to amplify the effect of an initial warming); also, increasing water vapor will tend to increase clouds, which reflect longwave radiation back to the surface, another positive feedback. However, clouds also reflect incoming solar radiation back into space, decreasing the amount that reaches the surface, which is a negative feedback; and also, even if warmer air can hold more water vapor, the energy necessary to evaporate it has to come from somewhere, and the only place it can come from is the ocean (which is where the majority of the water vapor evaporates from); thus, increasing water vapor in the air will tend to decrease ocean surface temperatures, another negative feedback. Nobody has a model that can reliably calculate which of the above water vapor feedbacks will predominate in a given situation, so the only way we can tell whether the overall water vapor feedback is positive or negative is by trying to make measurements of the various effects. However, this is very hard to do; the only piece of data which is readily available is humidity (the amount of water vapor in the air), but as you can see from the previous paragraph, this is only one of the possible feedback effects, so by itself it doesn't answer the overall question of which effects predominate. Furthermore, even the basic data on humidity is the subject of dispute: the "consensus" climate models, such as those used by the IPCC to make its projections, generally assume that relative humidity will remain approximately constant, which means that specific humidity--the actual mass of water vapor contained in a given mass of air--will rise as the air warms, by an amount that is easily calculated. See the Wikipedia article on humidity for an explanation of the definitions of these humidity terms if you're not familiar with them. However, some measurements, such as this NASA report, indicate that, while the amount of water vapor in the air has been rising as the Earth warms, it has not been rising fast enough to keep relative humidity constant, meaning that the IPCC models may be overestimating the amount of water vapor in the air. And just to make it complete, there are also measurements, such as the NOAA report referenced in this post by Anthony Watts, which indicate that specific humidity, at least at higher altitudes, has been falling in the past few decades, meaning that even this particular element of the water vapor feedback may not be positive! It is worth noting that none of this uncertainty appears in the IPCC reports; for example, this post on Niche Modeling compares the IPCC AR4 treatment of humidity with the NOAA data just referred to, with results not at all favorable for the IPCC, as well as discussing other examples of bias in "consensus" climate science. (If you want to dig into this particular issue further, the magic words are "climate sensitivity", and a quick Google search will turn up plenty of articles, not to mention acrimonious discussions. One such article is the one by Monckton that I linked to above; others that I have found useful are the Wikipedia article on Climate Sensitivity, which pretty much sums up the consensus view of "pro" global warming climate science, and this article by Roy Spencer, which argues that the consensus view significantly overestimates the climate sensitivity (meaning that there will be less warming than the IPCC thinks). The quick summary: a perfect black body, with no atmosphere, no feedback effects, none of that, just a perfect radiation absorber/emitter, would have a "sensitivity" of 0.27 at Earth's current average temperature of 15 degrees C--meaning that its temperature would change by 0.27 degrees C for every 1 Watt per square meter of "radiative forcing", which is just the initial imbalance between radiation coming in and radiation going out. The theoretical black body sensitivity depends on the temperature, which is why we have to specify "at Earth's current temperature". Any value greater than 0.27 means that there are positive feedbacks in the system--effects which amplify the initial temperature change due to a change in radiative forcing--and values less than 0.27 mean that there are negative feedbacks. The IPCC uses a value of around 0.75, indicating significant positive feedbacks--the IPCC number is often quoted as the "sensitivity to a doubling of CO2", which is the value I've just given multiplied by the estimated radiative forcing due to a doubling of CO2 concentration in the atmosphere, which is around 4 Watts per square meter; hence the IPCC's prediction of several degrees C rise in temperature during the 21st century, when CO2 levels are expected to rise significantly--how much depends on the specific "scenario" you're looking at in the IPCC report, but the high end estimate is close to a doubling of CO2 by the year 2100. The Miskolczi Paper. And just to throw another item into the foodmixer, in March 2008 I came across an article which claimed that the basic greenhouse equations are wrong. The article links to a paper by a Hungarian climate researcher, whose key claim is that the basic equations that underly current climate models assume that the Earth's atmosphere is infinitely thick. This may sound like an outlandish claim, but in fact such approximations are often made in science, because such assumptions often make the equations simpler, and that may make the difference between an equation that can be solved and one that can't. The original equation the paper refers to was discovered by Arthur Milne in 1922, and was used by him to study the behavior of stars; he made the "semi-infinite approximation" because without it the equation would not have been solvable, and climate researchers, when they adopted the equation for use in studying the Earth's atmosphere, kept it for the same reason. However, the author of this paper points out that today, with supercomputers at our disposal, we can solve much more complex equations, so it no longer makes sense to make the approximation. So what happens when the semi-infinite approximation is eliminated? An extra term is added to the equation which, in general, decreases the predicted difference in temperature between the top of the atmosphere and the bottom, other things being equal. In other words, for a given temperature at the top of the atmosphere (which is determined by solar irradiance), the semi-infinite approximation causes you to overestimate what the Earth's surface temperature should be for a given set of atmospheric factors such as the level of CO2 and other GHGs, water vapor and clouds, and so forth. Looking at this from the other direction, if you are given the Earth's surface temperature, using the semi-infinite approximation will cause you to underestimate the impact of solar irradiance on that temperature, compared with that of CO2 and other GHGs. Another point that I found interesting in this paper is its discussion of the effect that the Earth's gravity has on the atmosphere. This was the first time I have even seen the issue mentioned by a climate researcher, and after reading the paper that is surprising since the observations the author makes are so simple. Basically, his point is that the fact that the Earth's atmosphere is in a gravity well creates a negative feedback effect on the temperature of the atmosphere. This was so striking to me when I read it that I spent some time working out the mechanism for how gravity can regulate air temperature. Here's the gist of it: suppose we start with an atmosphere in hydrostatic equilibrium with a given pressure, temperature, and density at each boundary--one boundary being the Earth's surface and the other being the top of the atmosphere. (Technically, it's actually the "effective radiating surface", which is a "virtual" surface at the height at which the temperature of the atmosphere is equal to the Earth's "radiation temperature" as it appears from space--i.e., the temperature at which the outgoing radiation into space, on average, equals the net radiation coming in from the Sun. We'll call this the "top" of the atmosphere for this discussion, since the point I'm going to make isn't affected by this technicality.) Now suppose some heat gets added to this atmosphere, say by absorbing some extra radiation from the ground. What will happen to the overall volume of the atmosphere? Well, the pressure at each boundary can't change, because it's determined by gravity; so if the temperature goes up, by the ideal gas law, the density has to go down, meaning that the overall volume (since the total mass doesn't change) has to go up. The surface of the Earth can't move, so the only way the total volume can change is for the "top" of the atmosphere to rise. So far we're just restating the standard theory used in meteorology and climate science. However, notice what we've done: we've moved the "top" of the atmosphere upward, and since the total mass doesn't change, that means the effective "center of mass" of the atmosphere, considered as a whole, has also moved upward. But moving the center of mass upward requires work to be done on the atmosphere as a whole, which takes energy. Where does that energy come from? The only place it can come from is the atmosphere's kinetic energy--i.e., its temperature. In other words, if the atmosphere absorbs some extra heat from somewhere, and starts to warm up, some of the heat absorbed will have to go towards raising the air's center of mass instead of warming it up. That means that some of the extra energy absorbed by the atmosphere will not go towards raising its temperature--the gravitational potential energy of the atmosphere provides another "energy sink" that, as far as I can tell, has not been included in any of the climate models. Since the effect of this is to decrease the air's temperature rise for a given input of energy, this is a negative feedback--it works to reduce the effect of any given forcing. Other Factors. Another causal factor in climate change that we're only beginning to understand is the role of cyclical processes, the most significant being the El Nino/La Nina cycle in the Pacific Ocean, which are frequently mentioned in the news as causing shifts in climate. This paper looks at the climate data over the past couple of decades and finds that temperature change is far more closely correlated to the El Nino/La Nina cycle than to CO2 levels. We still don't really understand what causes these cycles, but we know that fluctuations in ocean temperatures and the solar cycle are contributing factors. The paper makes the same prediction that I noted above, that based on these causal factors, we may be in for a bout of global cooling in the next century, rather than warming. Of course, this is not settled science either, but once again, the point is that with people making plausible predictions in both directions, anyone who claims that we know what is going to happen to the Earth's climate in the next century is simply overstating their case. So where does all this leave us? First of all, as I mentioned above, it's still true that we don't know enough to predict with sufficient accuracy what will happen to the Earth's climate over the next century, despite the claims by global warming advocates that "the science is settled". It's not: it can't possibly be, when even the IPCC report admits we still have a low level of scientific understanding of key factors. It's still quite possible that positive feedback effects are being overestimated in the models, and that negative feedback effects are being underestimated or ignored. 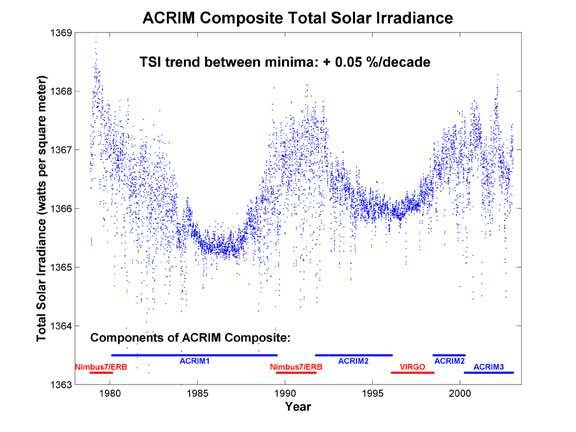 And it's also quite possible that a key causal factor, solar variability, is being underestimated as well, so that the models matching 20th-century data is really due to the fortunate (for them) coincidence that solar irradiance has been increasing over the past couple of centuries along with CO2. Second, the Pascal's Wager argument is now complicated by the fact that we need to consider the possibility of significant global cooling as well as warming. If it is true that the Sun right now is near a maximum in its longer term irradiance cycle (just as the Little Ice Age was the last longer term minimum), and that over the next century it is likely to start cooling down again, then what we ought to be worried about is another Little Ice Age, not further warming. It would seem, in that case, that the last thing we want to do is stop putting GHGs into the atmosphere, which would mean that we can't really use the Pascal's Wager argument because we have, not one, but two possible "danger" scenarios, and the actions we would need to take for them are mutually exclusive. But it isn't quite that simple, because if it's true that solar variability has been a significant driving factor in the recent warming, then that means GHGs have less of an impact than is widely believed--meaning that putting more of them into the atmosphere won't help to stave off another Little Ice Age. It also means, of course, that taking GHGs out of the atmosphere won't help to stop warming, if warming is what's going to happen. In fact, if solar variability is really the key causal factor, then we can't do much either way: we won't be coming up with a way to change the Sun's irradiance any time soon. The kinds of solutions we should be looking at in that case are ways to compensate for changes in solar irradiance, either by blocking some sunlight when there's too much (maybe by simulating what volcanic eruptions do by putting extra dust high in the atmosphere) or collecting more when there's too little (maybe by putting big mirrors out in space that can be adjusted to reflect some extra sunlight to Earth). Of course all this sounds a lot harder than using fluorescent bulbs and driving hybrid cars, and it is: but then so is building nuclear power plants, which was the main solution I originally advocated in this article. And I still do, because fundamentally what we really need to do hasn't changed: we need to give ourselves more options, and a key enabler for that is to give ourselves more available energy that doesn't come with strings attached. Nuclear isn't the only way to do that, of course; we should be pursuing every alternative source of energy we can find. Also, we should be trying to improve our scientific understanding of the climate, particularly in all those areas where it's currently low. Research in many of these areas has been sadly lacking, and that's not good. The bottom line, then, is that (contrary to what I thought when I first put up the original version of this article), Pascal's Wager is not the best framework in which to look at global warming, because we don't know that the costs of not doing something really are greater than the costs of doing something. (By the way, you may also have noticed a somewhat troublesome implication of the latest version of the Pascal's Wager argument: if both warming and cooling are viewed as "bad" outcomes, then that implies that the current climate is somehow "optimal", since any change away from it is viewed as bad. But we don't really know that, do we? Isn't it possible that there is some other "setpoint" to the Earth's climate that would be better overall, if we could only figure out how to find it? Of course, when put this way, nobody wants to do it, because of the cost--nobody wants to pay $5 a gallon for gasoline in the US like they do in Europe--but my point is that the other schemes will end up costing even more because they're less efficient. The "cap and trade" scheme is essentially a tax, but imposed after using federal tax money to subsidize the initial "issue" of CO2 emission permits--which means the taxpayers end up paying twice, one for the initial subsidy and again when the cost of emission permits gets passed on to consumers. As for "carbon offsets", the money from a CO2 emission tax could just as easily be put to use in subsidizing "offsetting" activities, but the link would be much more direct: when you buy carbon offsets, you have to estimate how many to buy based on assumptions about how much CO2 you've produced and how much CO2 will be offset by a given activity. With a CO2 emission tax, you pay directly when you engage in an activity that produces CO2, so you don't have to estimate anything, and the decision about how to spend the tax money would be made based on expert evaluation of the "offsetting" effect of proposed offset activities, not on the individual estimate (read "guess") of each person who buys carbon offsets today. In fact, as I've seen more than one blogger comment, carbon offsets seem to be the 21st century equivalent of the medieval Church's sale of indulgences: you get to continue all your "sinful" behaviors while still feeling like you've "done good". Personally, I wouldn't mind a CO2 emissions tax in the US, if it were accompanied by whatever reform it takes in the US legal system to prevent frivolous lawsuits from driving up the cost of new nuclear power plants. I am not the only one who thinks so: in The Question of Global Warming, a review by Freeman Dyson, in the New York Review of Books, of two books on global warming, the "optimum policy" he seems to favor (from one of the books reviewed, by Nordhaus) is twofold: find new energy sources, and in the meantime, put a tax on carbon emissions so people can weigh the externalities involved in burning fossil fuels. And do not, under any circumstances, adopt the extreme mitigation measures proposed by people like Al Gore; in fact, one of the scenarios evaluated in the book is labeled "Gore", and the author estimates that this policy would involve a net cost--that is, after the benefits are all added up and the costs of achieving them subtracted--of 21 trillion dollars over the next century. Another interesting item in Dyson's review is a quote from the first book reviewed: "Whether someone is serious about tackling the global-warming problem can be readily gauged by listening to what he or she says about the carbon price... To a first approximation, raising the price of carbon is a necessary and sufficient step for tackling global warming. The rest is at best rhetoric and may actually be harmful in inducing economic inefficiencies." I'm not sure I agree completely with the contention here, since "necessary and sufficient" implies that there are no other steps that need to be taken, which I don't think is true even "to a first approximation". But it is certainly true that, even if we start building nuclear power plants like gangbusters, that in itself won't be enough; we will need to change people's economic incentives if we want to significantly change their behavior with regard to energy sources. Another key point of the review by Dyson is twofold: (1) as the second book he reviews (a compilation of articles by scientists on different sides of the climate debate) shows, the state of the field is not encouraging: "Their conversation [i.e., between global warming supporters and skeptics] is a dialogue of the deaf. The majority responds to the minority with open contempt. "; and (2) in view of this, what we really need to help us decide what to do are analyses like that given in the first book, because "In the history of science it has often happened that the majority was wrong and refused to listen to a minority that later turned out to be right. It may--or may not--be that the present is such a time. The great virtue of Nordhaus' [the author of the first book] economic analysis is that it remains valid whether the majority view is right or wrong. Nordhaus' optimum policy takes both possibilities into account." While reading this review of the Miskolczi Paper, a good (if short) review of the paper I referred to above, that talks about replacing the semi-infinite approximation with a finitely thick atmosphere, and about the constraints imposed by hydrostatic equilibrium, I realized that I should probably include in this article a basic walk-through of the mechanism that the "standard" model uses to explain how increasing atmospheric CO2 causes global warming. (I gave some discussion of this above when I introduced the paper, but it bears repeating and elaboration.) Using that as a jumping-off point, we can then look at some of the possible complications and how they might affect the conclusions. None of this will be new: I've already stated various parts of it in the article above, but looking at it in a somewhat different way here may help clarify some things. Here R is the total outgoing longwave radiation into space (OLR), and F is the net incoming shortwave radiation from space (ultimately from the sun); "net" means that we have already subtracted the part that gets reflected, either from clouds or from the surface of the Earth. We assume for simplicity here that none of the incoming solar radiation gets absorbed by the atmosphere, so all of it reaches the surface (hence F appears in both places going down). Then S is the total outgoing longwave radiation emitted by the Earth's surface, which splits into two parts: A is absorbed by the (lower) atmosphere, and T is transmitted through the atmosphere (through what is sometimes called the "IR window", i.e., the "greenhouse gases" in the atmosphere do not completely absorb what is radiated from the surface). The surface also transmits energy to the atmosphere via non-radiative means (chiefly evaporation of water vapor); K symbolizes these effects. Finally, the atmosphere itself emits radiation, both upward into space (U) and down to the surface (D). It is obvious from these definitions that, as shown above, R = T + U. The other key fact we need for our discussion is that the radiative flux (energy emitted as radiation--all the terms above except for K are radiative fluxes) is entirely determined by the temperature (it goes as sigma * T^4, where sigma is a physical constant called the Stefan-Boltzmann constant). Thus, the only way that S, for example, can vary is if the temperature of the ground varies. Conversely, if the temperature changes, the radiative flux must change in concert with it. Now let's walk through the standard explanation of CO2-induced global warming using the above schematic picture. Let's suppose we're in an equilibrium state with all of the above variables fixed at some initial values F, A0, K0, S0, T0, D0, U0 (we don't put a subscript on F, incoming solar radiation, because we take it to be constant for this entire analysis). Now we add some more CO2 to the atmosphere. Other things being equal, the initial effect of this will be to increase A and decrease T (because the extra CO2 is absorbing more of the radiation emitted by the ground). This puts the system out of equilibrium: the atmosphere is now taking in more heat than it radiates away. (It also affects the heat balance at the top of the atmosphere, since T has decreased). The atmosphere rises in temperature, which increases U and D (which both depend on temperature). Now the surface is also out of equilibrium since D has increased; so its temperature rises, and S increases. T < T0, A > A0, U > U0, D > D0. U = U0, D = D0 (i.e., no atmosphere warming!). In the first alternate picture, we must have U > U0 (since T + U = F must be constant), and hence D > D0 (since atmosphere temperature drives both U and D, so if one goes up, the other must as well). So the atmosphere does warm in this case, even though the surface doesn't. In the second alternate picture, we must have T = T0 (since, again, T + U = F must be constant), which means that S = T + A > S0, so the surface does warm in this case, even though the atmosphere doesn't. How can this be? Well, remember that there is an additional variable in the problem, namely K, the non-radiative heat transfer from surface to atmosphere. The different possible equilibria described above simply correspond to different changes in K in response to the change in A. In the "standard" picture, as noted above, and in the first alternate picture as well, we can't be sure whether K is less than or greater than K0 at the new equilibrium; it depends on how much A rises relative to U and D. In the second alternate picture, it must be the case that K < K0, because U + D remains the same but A rises, and A + K = U + D must continue to hold. As far as I can tell, the "standard" picture does not place any significant constraints on how K can change; all it has is a vague expectation that more water vapor will be in the air if it warms. This would mean that K should increase in the "standard" picture and in the first alternate equilibrium above, but--by itself it offers no way of distinguishing between the two. In other words: as far as I can tell, from the basic thermodynamics of the situation, the "standard" picture, predicting surface warming in response to increased CO2, is not guaranteed to be right! One of the key new ideas in the Miskolczi paper can now be easily stated in the context of the above observations: it adds an additional constraint, based on the idea that the surface and the lower atmosphere should be in thermal equilibrium. This means that the lower atmosphere should absorb as much radiation from the ground as it emits to the ground; or, using our definitions above, A = D. This immediately has two consequences: first, it makes the second alternate equilibrium above exactly equal to the original equilibrium: that is, all the variables must retain their original values! (This should be easy to see from the above.) Second, it means that, to satisfy the atmosphere energy balance, if A = D, we must also have K = U. This confirms the vague expectation referred to above, that "warmer air means more water vapor", but, once again, it does not give us any way of seeing how the "standard" picture (with surface warming) is any more likely to be true than the first alternate (with no surface warming). The only difference between them is that K (= U) does not rise quite as much in the latter case as in the former. In summary: changes in water vapor evaporation are significant when trying to work out what the climate's response will be to greenhouse gas forcings such as CO2, and our understanding of how these changes work is very imprecise. It is quite possible that, on balance, water vapor is a negative feedback rather than a positive one, even though the first-order, "naive" effect is positive. Thus the most reasonable interpretation of these observations reported in Douglass et al. 2007 is that the theory behind GCMs based in the infinitely-thick atmosphere is falsified, and stratospheric compensation based in a semi-transparent atmosphere theory is confirmed. I should also note that, on further more detailed study of Miskolczi's paper, the "gravity-based negative feedback" effect I postulated above (and the related issue of whether gravitational potential energy is captured in the total energy balance in the models) seems to be much less important than the issue of what constraints there are on the atmosphere's optical depth, and how changes in water vapor and evaporation might help the atmosphere "adjust" its optical depth. Here I've just collected any other links I find which are of interest for this topic. Please note that I'm not saying I agree with what all of these links say (that would be impossible since often they take opposite sides). I'm just trying to illustrate how contentious the topic is and provide as much information as possible to help you sort out what's going on. Guide To Energy, Emissions And Greenhouse Gases By Bakken.com: A site with a number of good reference links on greenhouse gases and how they affect the climate. Thanks to Mrs. Purdy and the kids in her after school earth science program for the tip! Friends of Science: The website of a Canadian organization that is trying to get the Canadian government to re-evaluate its position on the Kyoto protocol. 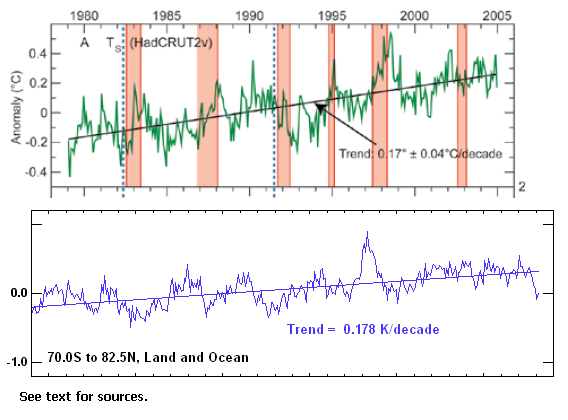 For a taste of their viewpoint, they have posted a paper debunking the "hockey stick" graph. Climate Controls: A 1997 article in Reason Magazine Online by Gregory Benford (noted SF author and Professor of Physics at UC Irvine). His take is summed up in the tag line at the top: "If we treated global warming as a technical problem instead of a moral outrage, we could cool the world." He suggests alternatives for preventing serious problems due to global warming that would not require reducing greenhouse gas emissions; in the context of the Pascal's Wager argument, this would fall under the "take action to prevent the warming" option, so it does not materially change the argument, although it does complicate that option somewhat (since any alternative technical solutions to preventing the warming will still have to be implemented with the knowledge that there are other good reasons to stop burning fossil fuels, so CO2 emissions are going to change over time anyway). The timing of the article (right before the international conference that spawned the Kyoto Protocol) is also interesting, particularly in retrospect. Note: Junk Science, like most other sites linked to in this article, is partisan, not neutral--it is on the "anti-warming" side whereas many others are on the "pro-warming" side ("anti" and "pro" referring to whether humans are causing warming, not whether the warming is good or not). The term "junk science" has also been co-opted by conservatives, including the Bush Administration and Republicans in the US Congress, as a general term of opprobrium for science whose findings they don't like, and the Junk Science site is caught up in that to some extent. So as always, take what they say with a grain of salt; but if you do some sifting you can find useful information. The Science and Pseudoscience of Global Warming: An article on Professor Steve Dutch's website discussing the arguments on both sides of the issue and picking out which ones "might be legitimate and which ones cross the line into pseudoscience". A good critique of the situation by a working scientist with no ax to grind but who knows something about the field (he's a geologist). Global Warming: A Perspective from Earth History: This report is even more extreme than most; it argues that the danger from global warming is so imminent that it may already be too late to completely prevent it--in other words, serious action is needed right now, regardless of the economic costs or impacts, just to keep the effects bearable. Note, however, that the main action it advocates--switching the global economy to nuclear power as the primary energy source--is basically the same one I advocate in this article. What Will Happen To Us: A page challenging some of the predicted CO2 and methane emission and concentration figures which are key to the overall predictions of the 2001 IPCC report. I actually found this site as a link in the comments section of the Real Climate site's article on Michael Crichton, which contains a good, if fairly brief, discussion between the author of the article and the "challenger". Global Warming: Experts' Opinions vs. Scientific Forecasts: A good exposition of the contrarian answer to the question of how so many scientific "experts" could all be wrong about global warming. Two articles on the ICECAP site that I particularly think are worth reading are the articles on the Complexity of Atmospheric Modeling and Assumptions and Feedbacks. The latter article has this tagline: "If before reading these [articles], you felt that atmospheric models should be fairly accurate and/or precise because they are based on well-known physical principles and equations, this author hopes that your faith is somewhat shaken." This latter article also mentions the hydrostatic equilibrium condition; however, it does so only in the context of the "equation of motion" of individual pieces of air in the atmosphere (basically, hydrostatic equilibrium is the equation of motion in the vertical direction). There isn't any mention of the effect of hydrostatic equilibrium on the overall energy balance. An Oceanographer Looks At The Non-Science Of Global Warming: The title is pretty much self-explanatory. This article includes a good (brief) historical overview of how we got where we are today in terms of climate change predictions. Did an Exploding Comet Cause the Greenhouse Effect? : An article on the hypothesis that the Tunguska Event in 1908 (in which a comet hit the Earth in Siberia) could be responsible for global warming. Too Darn Hot -- Common Sense in the Warming Debate: An article on the Reason magazine web site arguing that both sides tend to exaggerate their claims; the difference is that the global warming alarmists, unlike the global warming skeptics, don't take the heat (pun intended) for doing so. Pascal's Environmental Wager: From the "miserable old fart" blog, based in Wales, briefly describing the state of play (in June 2008) in that country. Environmentalists often liken technology and economic growth to a car careening down a foggy road. They suggest that it would be better if we slowed before we crashed into a wall hidden in the fog. The Precautionary Principle, its champions believe, "would serve as a 'speed bump' in the development of technologies and enterprises." Unfortunately, these principles and tenets may sound sensible to many people, especially those who live in societies already replete with technology. These people already have their centrally heated house in the woods; they already enjoy the freedom from want, disease, and ignorance that technology can provide. They may think they can afford the luxury of ultimate precaution. But there are billions of people who still yearn to have their lives transformed. For them, the Precautionary Principle represents not a speed bump but a wall. Oh, one last item: check out EcoEnquirer by Roy Spencer; it's basically climate science's version of The Onion. Hilarious--and even funnier when you find out, from Spencer's book (Climate Confusion), that some people don't realize that this site is a spoof (meaning it's also kind of like the Postmodernism Generator in its ability to identify the clueless).